All I can say is I’ve been busy. The Fall has flown by and with outdoor temperatures in the 70s…I must have slept through it and it’s summer again. No, can’t be…WAY too many leaves on the ground…it has to be fall. 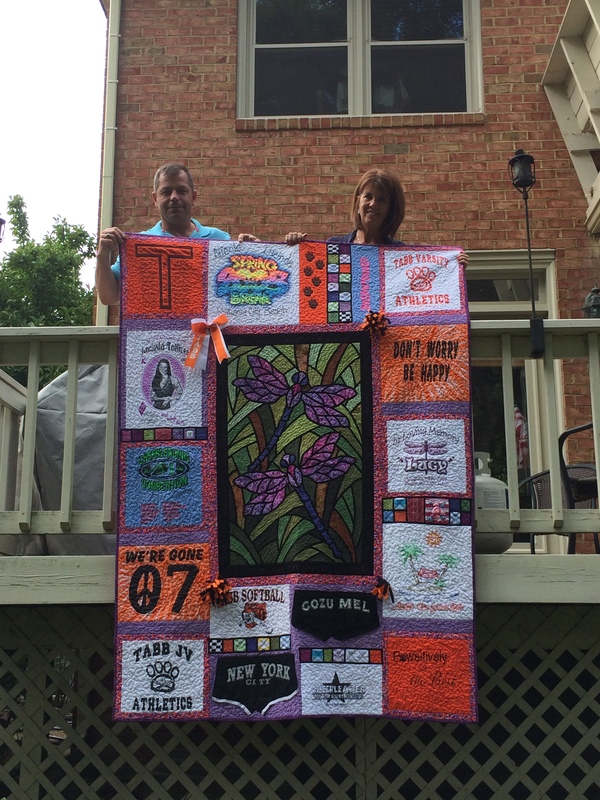 In September I gave our friends, Bonnie and Wade, a special quilt that I had been working on for them. They waited a long time since it had been nearly 3 years since I began. 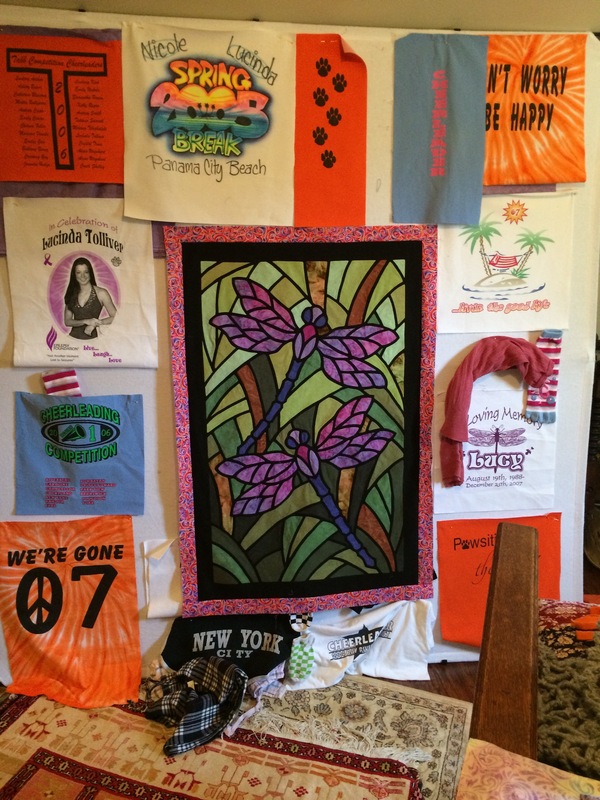 What can I stay… events interrupted my quilting life including 2 household moves, the renovation of this house, the youngest daughter graduating from high school then going off to college, the oldest daughter getting married, my husband retiring after a 32 year military career and the passing of my dear mother. 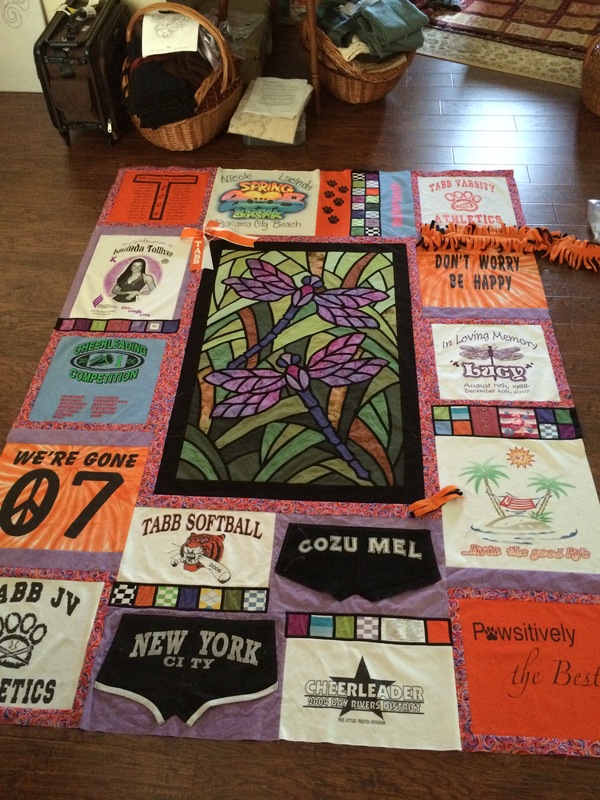 Fortunately I found little chunks of time to work on this special project for Bonnie and Wade. 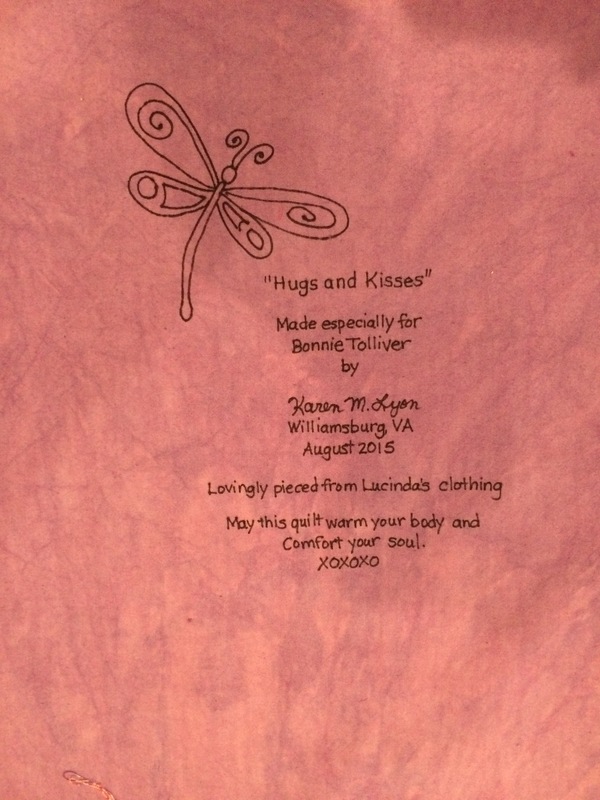 The quilt, “Hugs and Kisses”, is a memory quilt from the clothing and personal items of their daughter, Lucinda, who passed away suddenly on Dec. 25, 2007 at the age of 19. 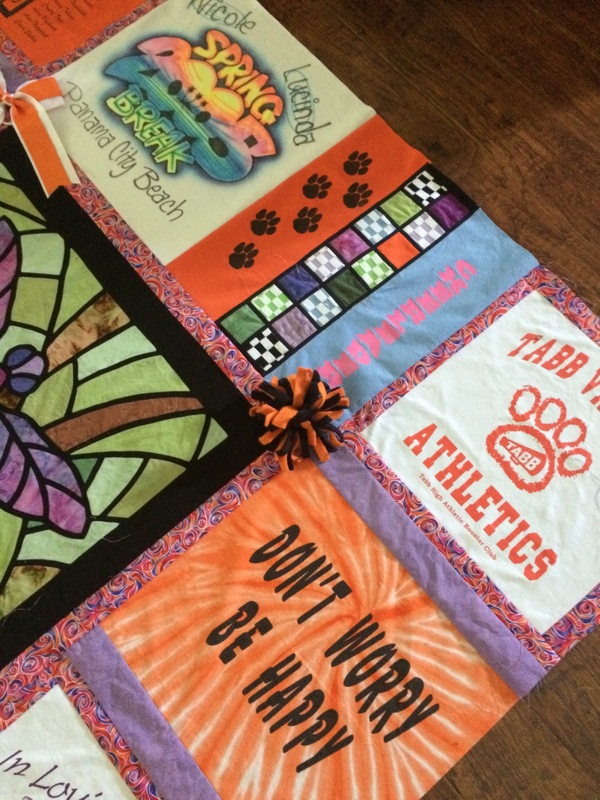 Here are some photos of the quilt in various stages. 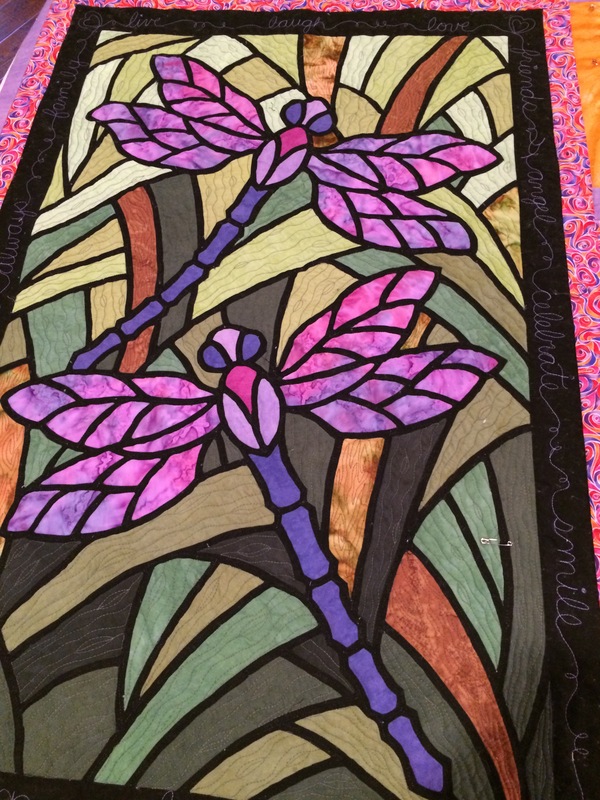 Step 2 -Lucinda loved dragonflies so I knew that would be a definite theme for the quilt. 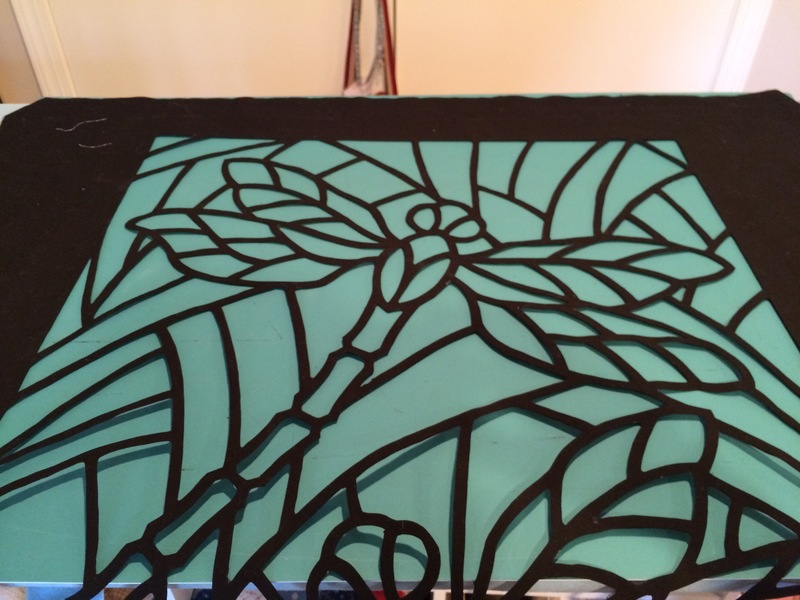 Inspired by the beautiful stained glass windows from my church at home I decided this stained glass dragonfly panel was perfect for the center. 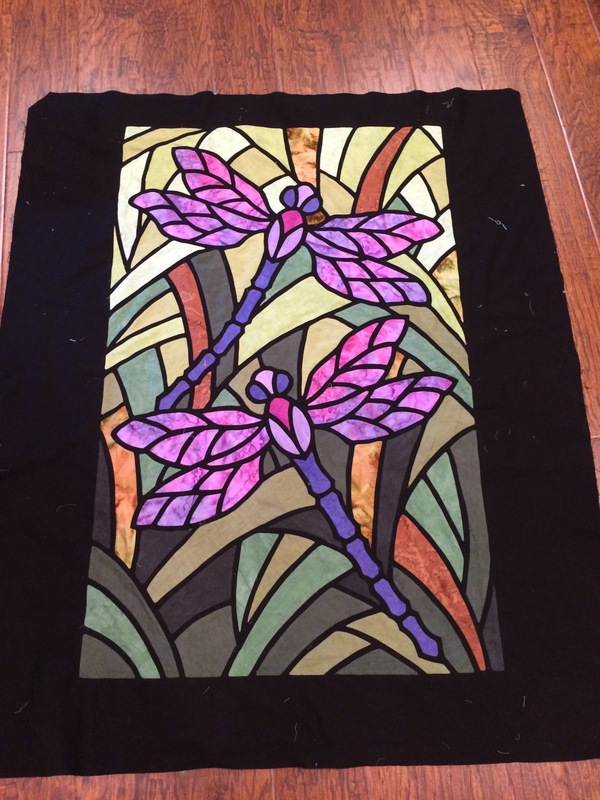 This time I used my favorite applique method using freezer paper in a reverse applique method. 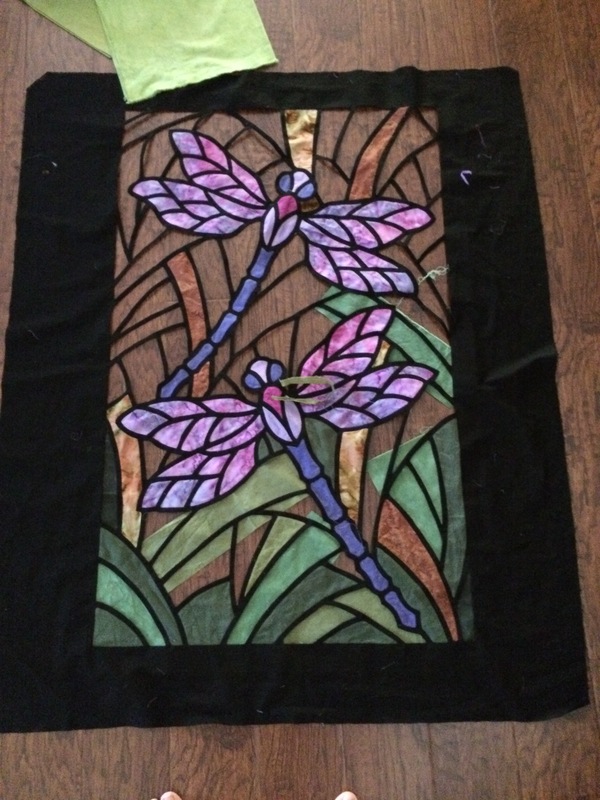 Fabrics using for the applique were mostly hand dyed Cherrywood fabrics and some batiks. 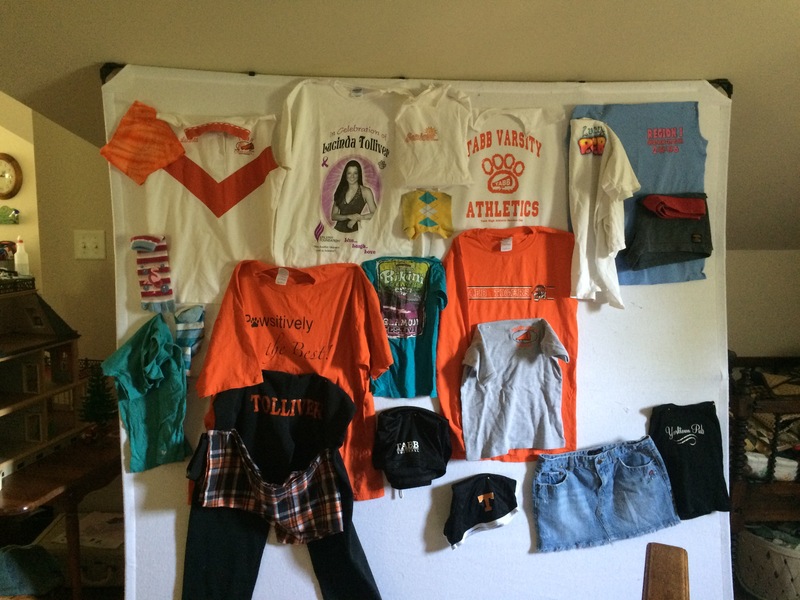 Step 3 – Back to the drawing board to work the other pieces of the puzzle. Working in the Lucinda’s cheerleader hair bow and fleece scarf. 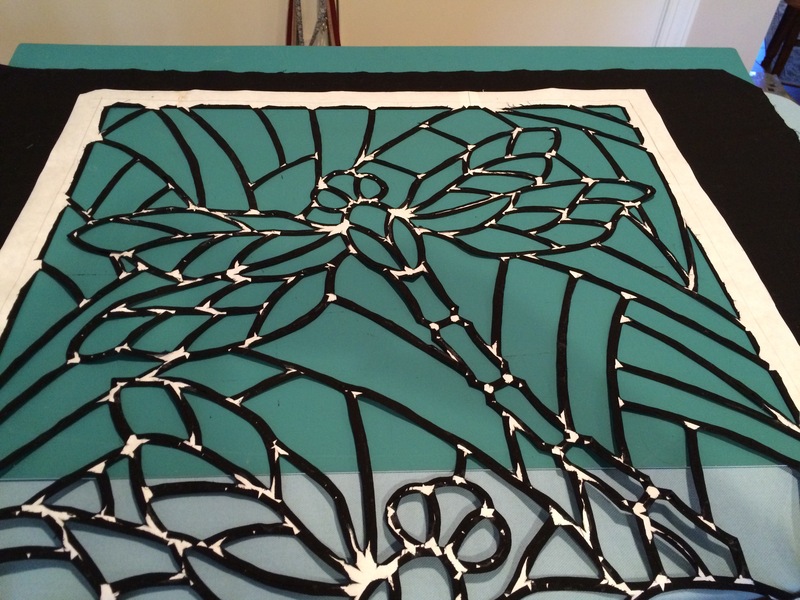 Step 4 – Machine quilting and finding the right words to describe Lucinda’s personality. 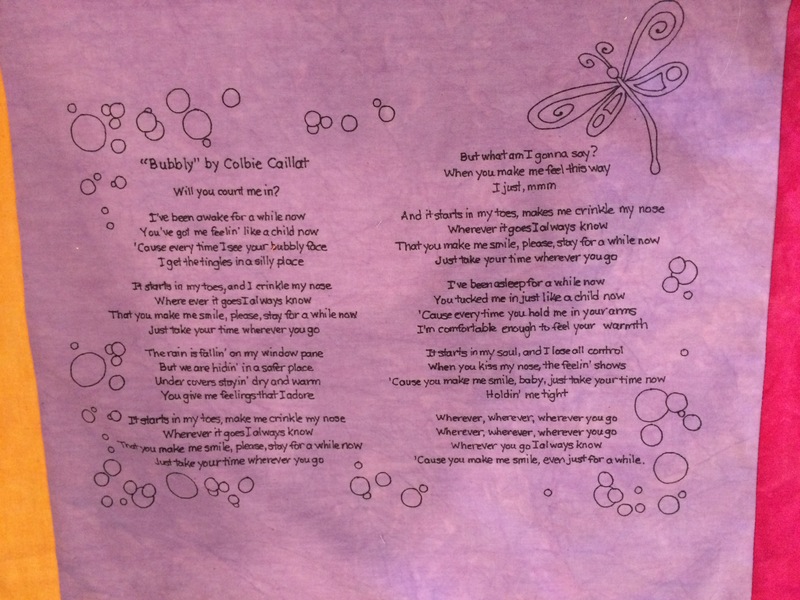 Step 5 – Special words for the label and the lyrics to a favorite song on the back of the quilt. 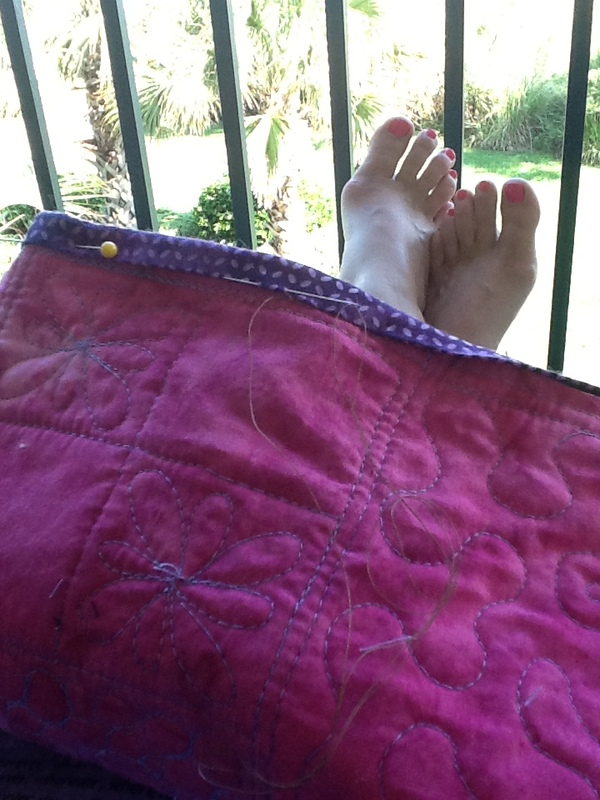 Step 6 – Hand sewing the binding at the beach! 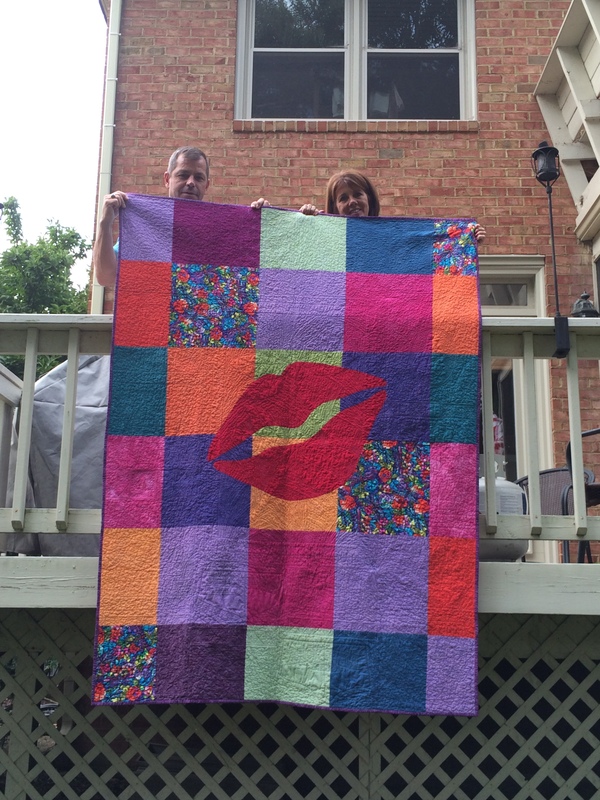 Then final step, handing it over to Bonnie and Wade!